Objective: To identify the p53 binding pocket as well as active residues in mdm2 protein, and search for similar (or) better compounds to inhibit mdm2-p53 interactions in comparison to FDA approved drug (Nutlin) by ligand and structure based virtual screening methods, docking, and molecular dynamic simulation studies. Results: We discovered several compounds that are potentially able to block the interaction between active residues of mdm2 and p53 complex, suggesting their capability to act as anti-cancer agents. As proven by our structure based virtual screening studies coupled with semi-flexible and flexible docking studies, compound ZINC59256947 was found to be the strongest inhibitors for mdm2 protein amongst all of those isolates from ZINC database. Conclusion: Our results suggest that, a simple, selective and reliable inhibition assay can be performed to search for novel inhibitors of p53-mdm2 interaction. Therefore this study provides a rationalization to the ability of a ZINC59256947, an isolate from ZINC database with strong binding affinity towards mdm2 protein, for future implications as anti-cancer agent. The p53 tumor suppressor protein is believed to modify the growth of cell, its ageing process and programmed internal death, after exposure to different levels of stress., The cells having damaged DNA and with increased chances of oncogenic mutations, are protected by p53 protein. P53 is usually present in very low cellular levels due to its degradation by MDM2. MDM2 is the main cellular protein to counteract the P53 and its action. The p53-MDM2 functional interaction is potential site of action for the newer groups of drugs due to its functional implications in different diseases including cancers. A recent and newer FDA approved drug: Nutlin, has a high affinity to MDM2. Nutlin is the negative regulator of MDM2-p53 interaction with a wider implication in control and arrest of oncogenic transformation. In this scenario, the focus is on investigating the interaction between mdm2-p53 at molecular level to find the potential newer compounds capable of regulating MDM2-p53 interaction with future clinical uses. In this study, the structure based virtual screening approach is used to identify target specific mdm2 inhibitors via docking studies. MDM2 is a protein transcribed by MDM2 gene and is known as E3 ubiquitin-protein ligase Mdm2., Functions of Mdm2 includes (i) ubiquitin ligase that binds to the the amino-terminus transactivation domain (TAD) of the p53 (ii) an inhibitor of p53 transcriptional activation, and (iii) inhibitor of the p53 tumor suppressor.,, Inappropriate propagation of cells carrying damaged DNA and potential mutagenicity under various stress types are usually prevented by high p53 protein levels in the nucleus and at the mitochondria via independent as well as transcription-dependent function., In normal unstressed cells, MDM2 mediates the continuous degradation of highly unstable p53 whose half-life is in between 5 to 30 min. Montes et.al in 1995 has elucidated the importance of the MDM2-p53 interaction by showing mice lacking mdm2 to die in the early embryonic stages before implantation. This phenotype was overcome by inhibition and deletion of p53, suggesting that the embryo lethality was due to active p53. Since, mdm2 measures the p53 activity; deletion of mdm2 gives an active p53 that has damaging consequences on the cell and embryo. At molecular level, crystallographic data has further elucidated the mdm2-mediated p53 inhibition via showing that amino terminal domain of mdm2 consists of a hydrophobic cleft, which traps the transactivation domain of p53, thereby restricting it from interacting with transcriptional machinery. On the other hand, over expression of mdm2 proteins has been widely reported under many cancer types, suggesting mdm2-p53 interaction importance towards causing cancer. Thus, targeting mdm2 and inhibiting p53 binding with is a promising approach to treat many cancer types. Targeting mdm2-p53 interaction has a great potential to identify efficient, target specific small molecule inhibitors for various types of cancer in one go; and is been proven with the recent evidence based discovery of Nutlin compound. However, there is still large space of chemical compounds present with drug like profile, which are worth considering investigation to know whether they have high specificity with mdm2 drug target in specific for cancer therapy. In view of the time and money constraints to carryout assay based screening of this over 10 million compounds database in order to identify lead like compounds out of this huge database, choosing computational methods is the single most alternative option to fasten the screening process and to identify lead compounds which are worth considering for further clinical based studies. Schrodinger's maestro visualization program and Accelry's discovery studio 4.0 is utilized to visualize the receptors, ligand structures, hydrogen bonding network, to calculate length of the bonds and to render images. We looked in ZINC database to find compound similar to MDM2 inhibitor. Autodock Vina is the primary docking program used in this work for the structure based virtual screening. Auto-Dock Tools version 1.5.6 (The Scripps Research Institute, La Jolla, USA) is used for preparation of the ligands and protein receptors in pdbqt file. The same tool was also utilized to find out the grid boxes., Schrodinger's Desmond module was used for molecular dynamics simulation studies. The three-dimensional structures of mdm2-p53 complex were retrieved from the Protein Data Bank. These structures were prepared by removing all bound crystal water molecules and heteroatoms including ligands. Missing hydrogen bonds were added after. These structures were further energy minimized using charms force field for optimal docking results. Virtual screening based on the structure of mdm2 inhibitor was carried out using the ZINC database. Two-dimensional structure of mdm2 inhibitor Nutlin was used to search for similar compounds in the ZINC database, from the most common chemical suppliers (ChemBridge, ChemDiv, Ryan, Asinnex, MayBridge, Sigma-Aldrich, Comgenex, Otava and Specs), covering over 21 million chemical compounds. 5195 compounds with a threshold limit of 50% similarity were identified to be structurally similar with mdm2 known inhibitor. These 5195 compounds were used in further molecular docking analysis. 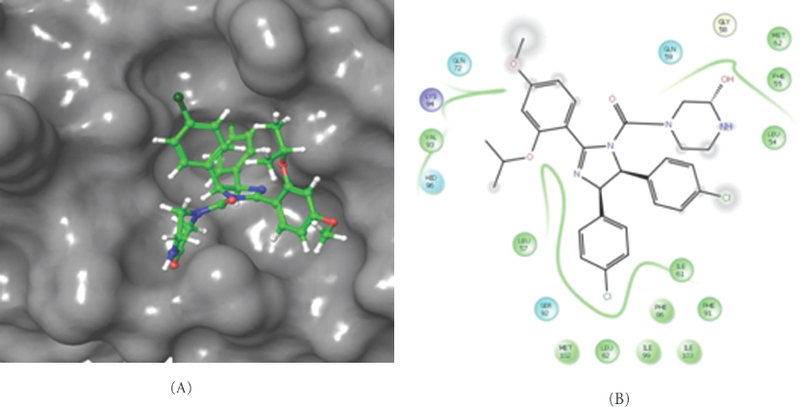 Autodock vina was utilized to search for potential inhibitors amongst the 5195 compounds found through ligand based virtual screening, targeting mdm2 active site (p53 binding site). A spacing of 0.4 Å between the grid points was used. Lamarckian Genetic Algorithm (LGA) was selected as docking engine with the default parameters. After each LGA run, Autodock reported the best docking solution with lowest energy as the final outcome were dependent on cluster analysis and Gibbs free energy. Docking simulation was performed to find and select the lowest energy among the 10 docking mode given by cluster analysis. The receptor and ligand system solubility based on themo dynamic stability is studied by “Desmond v3.6 Package”. 0PLS2005 force field was used to mimic water molecules using known TIP3P water model. The repeating units at 10 Å distances were defined within the limitation of specific shape and size by setting up Orthorhombic periodic boundary conditions. MD simulation performed within the radius of periodic boundary in the NPT ensemble. Nose-Hoover temperature unit and isotropic scaling utilized to fix the temperature at 300 K and atmospheric pressure of 1 respectively. This process was succeeded by going through 10ns NPT formation simulation and using 5ps intervals to the configuration obtained thereafter. In this work, different in-silico approaches were applied to virtually screen for potential inhibitors targeting mdm2 protein for cancer therapy. As it is established that structurally similar compounds have same pharmacological features, we performed a virtual screening (ligand based) in ZINC database, to identify structurally similar compound to Nutlin. Thus found 5195 compounds were used to perform structure based virtual screening on mdm2 protein, targeting the same active site, which is involved in the p53 binding. The docking studies for Nutlin compound with the mdm2 protein targeting its p53 binding site is performed to understand the Nutlin-MDM2 complex binding energy and molecular interaction. The overall energy of -11.69 Kcal/mol was used for this complex formation. This compound formed no hydrogen bonds, ionic bonds and water bridges. However, found to be forming hydrophobic interactions with MET62; PHE55; LEU54; ILE61; PHE91; PHE86; ILE103; ILE99; LEU82; MET102; LEU 57 and VAL93 along with hydrophilic interactions with GLN72; HID96; SER92 and GLN59 residues [Figure 1]. After successful docking analysis, MD simulations were performed to find out the required energies and other unknown molecular interaction, yet to discover. Figure 1: Docking snapshot of mdm2-Nutlin complex in a) 3D representation and b) 2D representation. The structure based virtual screening for mdm2 protein was carried out targeting the key residues involved in their active binding of p53 peptide, and the results displayed. The compound isolated from ZINC database similar to Nutulin, were virtually screened onto the mdm2 protein targeting its active binding site where p53 binds. Among 5195 compounds analyzed, 2965 compounds were successfully docked with a binding energy range of -18.53 to -4.40 Kcal/mol. The compound ZINC59256947 showed the highest binding affinity of -18.53 Kcal/mol of binding energy. The result of this virtual screening is tabulated [Table 1]. The compound with highest binding affinity possessing ZINC59256947 was taken for further analysis using molecular dynamic simulations. MD simulations were performed in order to analyze the stability, conformational changes and underlying molecular interactions at atomic level of mdm2 protein alone first and in comparison to Nutlin and ZINC59256947 compounds thereafter. The MD simulations were carried out within the given temperature, pressure and volume defined by simulation quality parameters. 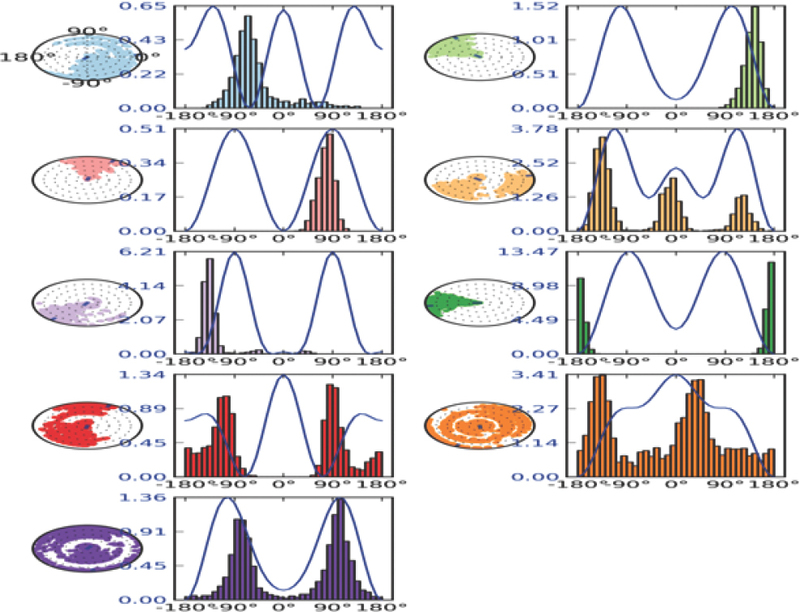 The studies were performed in different standard simulation parameters: (i)Root mean square deviation (RMSD) [Figure 2],(ii)	Root	mean square fluctuations (RMSF) [Figure 3],(iii)	Radius of gyration (ROG) [Figure 4], (iv) intra molecular hydrogen bonds [Figure 5]; (v) total energy [Figure 6]; and (vi) its total secondary structure elements (SSE) [Figure 7]. The main objective of MD simulation was to understand the dynamics and stability of MDM2 protein in its native state or in interaction with Nutlin and ZINC59256947 compounds. The overall statistical data after the analysis of the MD trajectories is compared [Table 2]. Table 2: MD simulation data analysis of mdm2 protein, mdm2-Nutlin complex and in complex with the best compound found through the virtual screening (i.e, ZINC59256947). Figure 2: Root mean square Deviation (RMSD) graphs: mdm2-apo state (red); mdm2-Nutlin complex (blue) and in complex with best compound found through virtual screening (green). 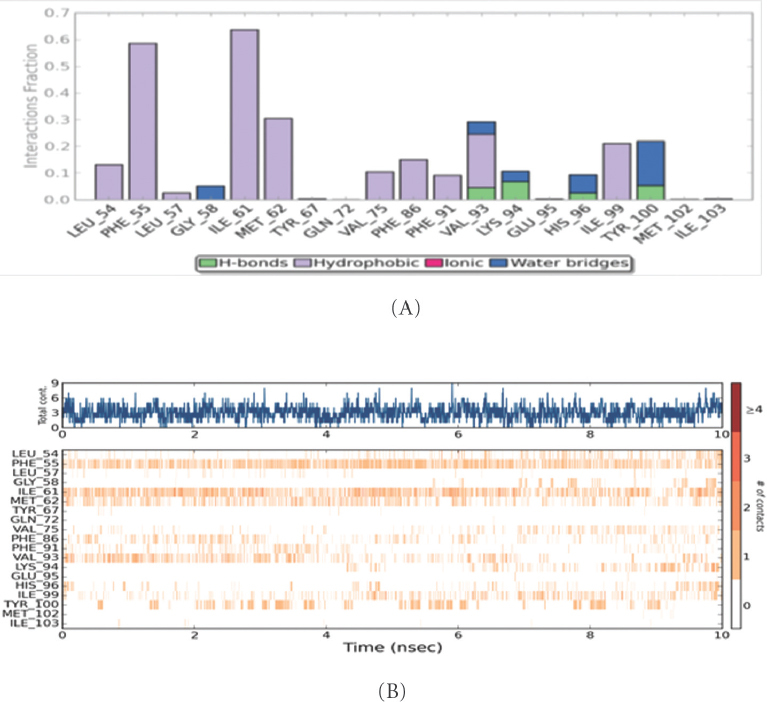 Figure 3: Root mean square Fluctuations (RMSF) graphs: mdm2-apo state (red); mdm2-Nutlin complex (blue) and in complex with best compound found through virtual screening (green). Figure 4: Radius of Gyration (ROG) graphs: mdm2-apo state (red); mdm2-Nutlin complex (blue) and in complex with best compound found through virtual screening (green). Figure 5: Total intra molecular hydrogen bonds graphs: mdm2-apo state (red); mdm2-Nutlin complex (blue) and in complex with best compound found through virtual screening (green). Figure 6: Total Energy graphs: mdm2-apo state (red); mdm2-Nutlin complex (blue) and in complex with ZINC59256947 (green). Figure 7: Secondary structure elements (SSE): a) mdm2-apo protein b) mdm2-Nutlin complex and c) mdm2 protein in complex with ZINC59256947. RMSF of the mdm2 protein in complex with ZINC59256947 pattern of residue fluctuations were found to be very close and similar to that of mdm2 protein in complex with nultin, suggesting that this best compound is causing similar conformational changes in mdm2 protein in comparison to Nutlin compound. Radius of gyration (ROG) gives us the compressed nature of the protein structure by using radius. Protein showed quite stable structure by lacking any major expansion/contraction throughout the simulation period. However, slight expansion of the protein has been found with the best compound compared to mdm2-apo state and Nutlin complex. Intra molecular hydrogen bonds were analyzed to better understand the underlying forces in relation to protein structure stability. Protein rigidity is denoted by increased intra molecular hydrogen bonds. This observation clearly showed that the proposed compound ZINC59256947 have the potential to inhibit the mdm2 protein, with no alterations in mdn2 rigidity, as found in case of Nutlin compound. The overall energy involved for stabilization of mdm2 protein-apo state; in complex with Nutlin compound and in complex with ZINC59256947 was studied with other parameters [Figure 6]. This data suggests that our best compound mdm2 in complex with ZINC59256947 has better inhibiting potential compared to Nutlin compound. The total secondary structure elements (SSE) present in the protein as alpha helices and beta strands throughout the simulation trajectory were monitored [Figure 7]. The in-depth inter-molecular interactions were studied with simulation interactions diagram within Desmond module of Schrödinger. There were about 0-9 contact found in between mdm2-Nutlin compound with 4 hydrogen bonds in between them, with residues VAL93; LYS94; HIS96 and TYR100. Nutlin compound also formed pi-pi stacking with PHE55 and various hydrophobic contacts with residues LEU54; PHE55; LEU57; ILE61; MET62; VAL75; PHE86; PHE91; VAL93 and ILE99. On the other hand, residues GLY58; VAL93; LYS94; HIS96 and TYR100 were found to be actively participating in forming water-bridging bonds [Figure 8]. Figure 8: a) Mdm2-Nutlin complex protein-ligand interactions. Here the figures given in X-axis are normalized over the course of trajectories. b) Representation of interactions and contacts of H-bonds plotted against time. The top panel gives the overall contact between protein and ligand. Some of this ligand can have more than one contact (Dark orange). For mdm2-ZINC59256947 complex, there were about 0-9 contact in total with no hydrogen bonds. However, it formed extensive hydrophobic interactions with residues ILE61; ILE99; TYR67; VAL93; LEU54; LEU57; PHE55; MET62; PHE91; HIS96; ILE103; TYR100; and VAL75 along with pi-pi stacking. The residues PHE86; HIS96; TYR67; PHE55. LEU54; PHE55; GLY58; GLN59 and GLN72 were also found to be forming water-bridging bonds during MD simulation [Figure 9]. Figure 9: a) Mdm2-ZINC59256947 complex protein-ligand interactions. Here the figures given in X-axis are normalized over the course of trajectories. b) Representation of interactions and contacts of H-bonds plotted against time. The top panel gives the overall contact between protein and ligand. Some of this ligand can have more than one contact (Dark orange). The torsional degrees of freedom in the ligand given by rotational bonds were studied to understand the dynamics associated with it. A total of eight rotatable bonds have been observed in Nutlin, which are present between ligand atoms 1 and 18; 3 and 34; 4 and 27; 5 and 6; 7 and 12; 9 and 16; 12 and 13 and finally between 18-20 [Figure 10]. Figure 10: Nutlin-ligand torsion showing rotatable bonds within simulation trajectory (0.00 through 10.00 nsec). A dial/bar plots with the same color also represent these rotatable bonds torsion. Dial gives the manner of torsion formation throughout the course of the simulation. 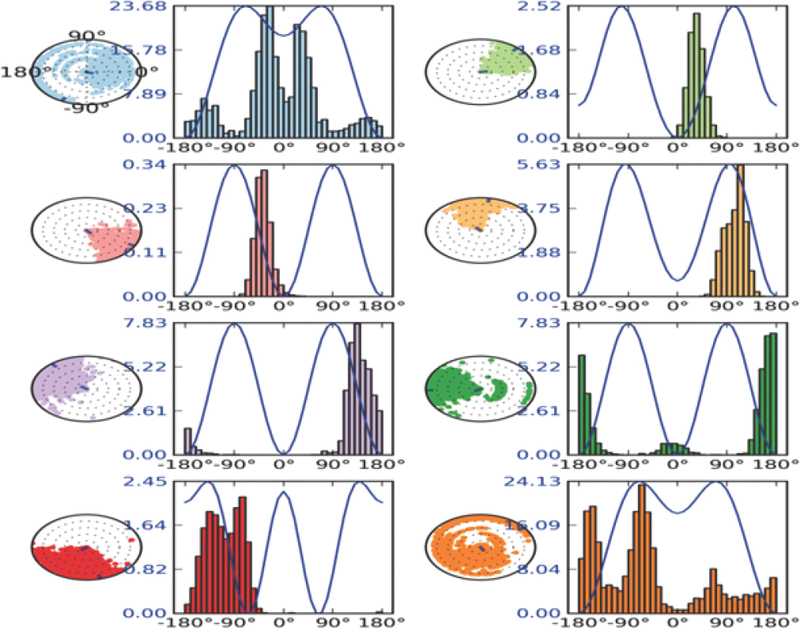 Center of the radial plot denotes the beginning of the simulation against the time, which is plotted radially outwards. The bar plots represent the dial plot by giving approximation of the density of the torsion. The plot also gives the potential of the rotatable bond if available (by adding the potential of the related torsions). Left Y-axis represents the values of the potential in Kcal/mol. The torsional degree analyzation of freedom for the rotatable bonds present in the ligand is performed to examine and estimate the ligand torsion dynamics facilitating for the hydrogen bonds along with other interactions between mdm2-ZINC59256947 complexes. For the compound ZINC59256947, 9 rotatable bonds were observed in between ligand atoms: 1-28; 2-22; 3-6; 3-12; 5-35; 12-14; 14-15; 15-16 and 28-29 [Figure 11]. Figure 11: ZINC59256947-ligand torsion showing rotatable bonds within simulation trajectory (0.00 through 10.00 nsec). A dial/bar plots with the same color also represent these rotatable bonds torsion. Dial gives the manner of torsion formation throughout the course of the simulation. Center of the radial plot denotes the beginning of the simulation against the time, which is plotted radially outwards. The bar plots represent the dial plot by giving approximation of the density of the torsion. The plot also gives the potential of the rotatable bond if available (by adding the potential of the related torsions). Left Y-axis represents the values of the potential in Kcal/mol. Finally, the post docking analysis to check for the similarities between the p53 and our proposed compound ZINC59256947 is done via superimposing the docked conformation. The proposed compounds mode of inhibition is very much similar to p53 peptide; especially prominent alignments were observed with the p53 residues TRP23 and LEU26 [Figure 12]. The discoveries of compounds that are able to block the interaction between active residues of mdm2 and p53 complex suggest their capability to act as anti cancer agents. Compound ZINC59256947 was found to be strong inhibitors for mdm2 protein. The structure based virtual screening studies coupled with semi-flexible and flexible docking studies, proposes that the tested compounds have the capability to attenuate the mdm2 protein for plausible anti cancer activity. All the compounds discovered here bind the same active binding site of mdm2 where p53 peptide binds, by creating hydrogen bonds and various non-covalent interactions. 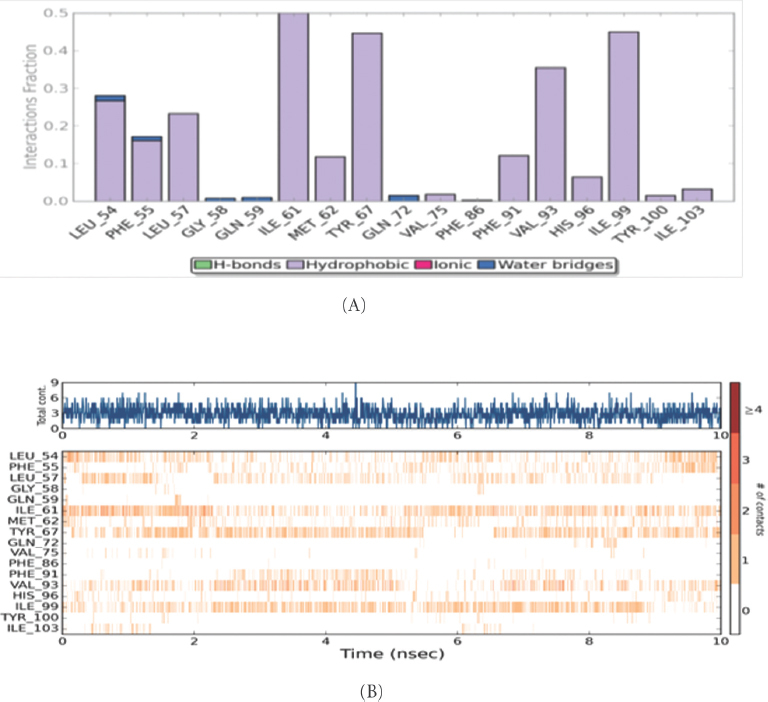 The computational analysis also supports large value of binding energy being involved in five present compounds being investigated here with the mdm2 protein consolidating their complex's thermodynamic stability. The predicted IC50 values further solidify our objectives of potential inhibition of mdm2 protein. To substantiate it further, de novo simulations for 10 ns suggest residues of mdm2 and ligand interactions, could be critical for its inhibitory activity. 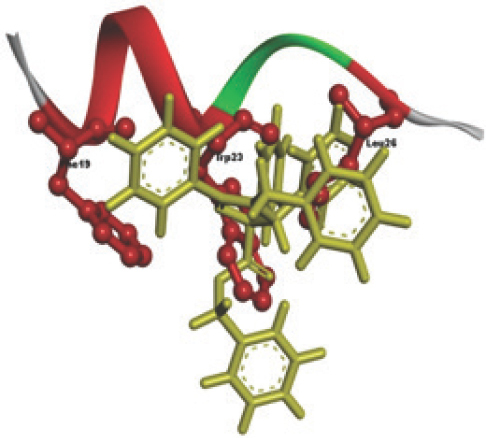 The present study gives us an insight of the valuable small ligand molecule with strong binding affinity towards mdm2 protein for plausible anticancer activity. Figure 12: Superimposition of the ZINC59256947 compound (yellow) with p53 peptide showing the alignments of the compound's side chain benzene rings almost in the same orientation as that of PHE19; TRP23 and LEU26 residues of p53 showing the strong binding association. Above panels depicts the same in various orientations. MDM2 can be the site of drug target for their interactions with other cellular proteins; notably P53. This information could be utilized to screen and find out possible mdm2 targeting drugs with their anti-cancer properties. Understanding the molecular dynamics and interactions of ligand and receptor in association with MDM2 protein can be a useful link to discover many more mdm2 target specific drug compounds in the future. Maestro, version 9.6, Schrödinger, LLC, New York, NY, 2013. Desmond Molecular Dynamics System, version 3.6, D. E. Shaw Research, New York, NY, 2013. Maestro-Desmond Interoperability Tools, version 3.6, Schrödinger, New York, NY, 2013. Dr. Vijay Raj. Bollapalli, PhD is an honorary consultant for differently abled persons in hospital administration, and associate director for development action for Women network (dawn). He possesses distinguish experiences in research. Dr. Rao, Ph.D, worked as professor in India, China, Nepal, Libya, and Philippines. Currently he is presently Dean of Student Affairs at Avalon University School of Medicine, Curacao, Netherland Antilles. Dr. Rao has more than 44 years of teaching and research. The Royal Society United kingdom awarded him with 3 fellowships in 2016. Dr. Yogesh Acharya, MD has worked as a teaching faculty in different medical universities across the world. Dr. Acharya is an ECGMG certified physician. He is currently employed as an assistant professor in Department of Epidemiology and preventive health at Avalon University School of Medicine, Curacao, Netherland Antilles.